After three days of revelry during the Feria des Vendanges (Grape Harvest Festival), Nîmes returned to normal yesterday. Most of the vendors selling paella, sangria and colorful oil paintings had already packed their tents during the night and moved on to the next big event. The Roman amphitheater, however, remained. Even though governments, wars and festivals have come and gone, the arena is still there, just as it was when the city was called Colonia Augusta Nemausus in honor of Julius Caesar's son, Auguste. During my audio guided tour of the amphitheater, I placed my hand on one of the polished stones and wished, as most people do while visiting historical monuments, that it could talk. Not only would it tell tales of gladiators and pageantry but also of a complex Gallo-Roman society, whose citizens were seated in the 24,000 arena according to their social status. "Arena" is the Roman word for sand. Sand was used in the arena to deaden the sound of the animals' hooves, to soften the landing when a gladiator fell and to soak up the blood of the injured. When I went to the bullfight on Saturday, the amphitheater looked much as it would have when it was constructed nearly 2,000 years ago. Regrettably, the large material banners that provided shade for the spectators are no longer there. The audience watching a bullfight in the Roman amphitheater in Nîmes. Roman monuments in Nîmes include the Temple of Diana, the Tour Magne and the Maison Carrée (Square House), which influenced the design of the Madeleine Church in Paris and Thomas Jefferson's design of the Virginia state capitol. (Thank you, Joseph, for commenting and calling my attention to my omission of the Madeleine Church!). I do not know of the Tour Magne, but the Temple of Diana (Artemis) was Greek, meaning it was build long before the Romans began building temples. So, it influenced the Maison Carree, not the other way around. Also, the Maison Carree influenced the Madeleine in Paris--very similar structures. I find it interesting that you haven't posted pictures of the actual bullfight. Too gruesome? Sorry, the wording of that sentence is ambiguous. Thanks for pointing it out, I'll have to go back and rewrite it. What I intended to say is that the Maison Carree influenced Thomas Jefferson's design of the Virginia state capital. It didn't, as you correctly stated, influence the Temple of Diana. Thanks for mentioning that the Maison Carree also influenced the design of the Madeleine in Paris. I had forgotten to include that. And speaking of the Madeleine, it's one of my favorite places to eat when I'm in that part of town. I'm going to write a post about it in the near future. I've been tippy-toeing around the subject of the bullfight while trying to decide if I would post any pictures of it because it was really gruesome, much more than I had expected. After lots of soul searching, I decided that I would write about it and post photos tomorrow without any censorship. Most of the pictures that we usually see are of the early phases when the bull is still in relatively good shape. Consider yourself forewarned. Okay, wait. Another clarification: there is a Temple of Diana in Nimes--now I get it. I was thinking of the classical one from Greek times, one of the Seven Wonders of the World, which is not in Nimes. 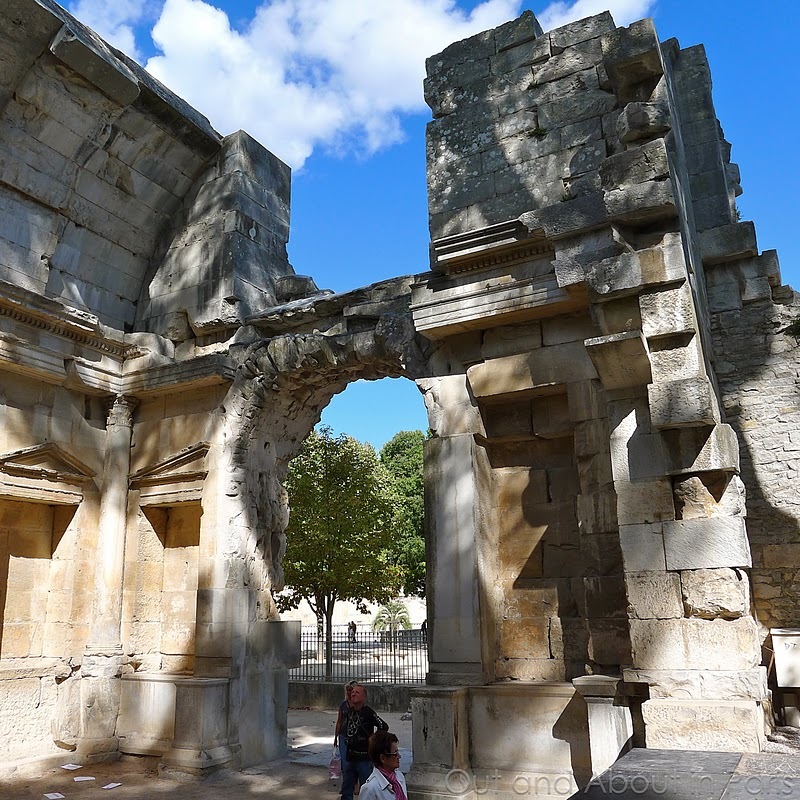 The Nimes temple would indeed be Roman, and easily influenced the Maison Carree. And thanks for the forewarning about tomorrow's post. I'm actually gruesome-phobic, but I will still be checking in. Thanks for telling me that the Temple of Diana is one of the Seven Wonders of the Ancient World. I didn't know, even though I'm fairly sure that I visited it in Ephesus last year. I'll have to dig out my photos and take a look. And I'm sorry that my wording was so confusing - the Maison Carree didn't influence the Temple of Diane, only the Madeleine Church in Paris (as you mentioned) and the Virginia state capitol.